To celebrate the UN International Year of Biodiversity, organic gardening goes ‘native’ and ‘wild’, to promote nature inspired planting designed to attract wildlife and provide an edible landscape that offers a wealth of ingredients for a variety of Autumn recipes. 1 kg plums, sliced and stoned, 1.5 kg apples,500 g shallots,500 g soft brown sugar,600 ml cider or white-wine vinegar, chilli sauce or flakes to taste, Cut ginger and black peppercorns are tied within a small muslin bag and cooked with the rest of the ingredients. Make the spice bag first and place into a large soup pan with the other ingredients. Bring slowly to a boil, stirring occasionally. Let the mixture simmer until soft and thick. Pot the chutney, while warm into sterilized jars. Store in the fridge. Wash the fruit, slice the apples, and cook the Damsons, Sloes and Hawthorn Berries whole. Simmer gently until the fruit is soft, strain through muslin, and leave to drip in a bowl for an hour. Measure the strained fruit juice, return to a clean pan and heat gently. For every litre of liquid add 800 g of sugar. Stir until dissolved, then boil steadily (approx. 10 minutes) until a high setting point is reached, (check to see if the juice sets on the back of a spoon). Remove from the heat, skim, and store in sterilised jars. Pick 500 g of elderberries and strip them from their stalks, add one small onion , cinnamon to taste, 250 g malt vinegar, 1 cooking apple, a handful of currants, and 75 g soft brown sugar. Wash the elderberries, peel and slice the onion, put them in a large saucepan together with the salt and cinnamon, add the vinegar, and cook until onion, and elderberries are soft. Strain the mixture through muslin, return to a clean pan and add the apple, currants and sugar. Bring slowly to a boil, stirring until the sugar has dissolved. Store in sterilised containers. Wash the apples and cut them into quarters. Place in a large saucepan with the water and lemon juice, bring to the boil, then reduce the heat and cook the fruit until reduced to a pulp. Leave the fruit to cool slightly then strain or drip through muslin. Measure the resulting liquid, pour into a large clean saucepan and allow 450 g of sugar for each 600 ml of juice. Stir over a low heat until the sugar dissolves, then bring to a hard boil and boil until setting point is reached. To add interesting flavour to the jelly, add cloves, mint, chili, cinnamon, etc. 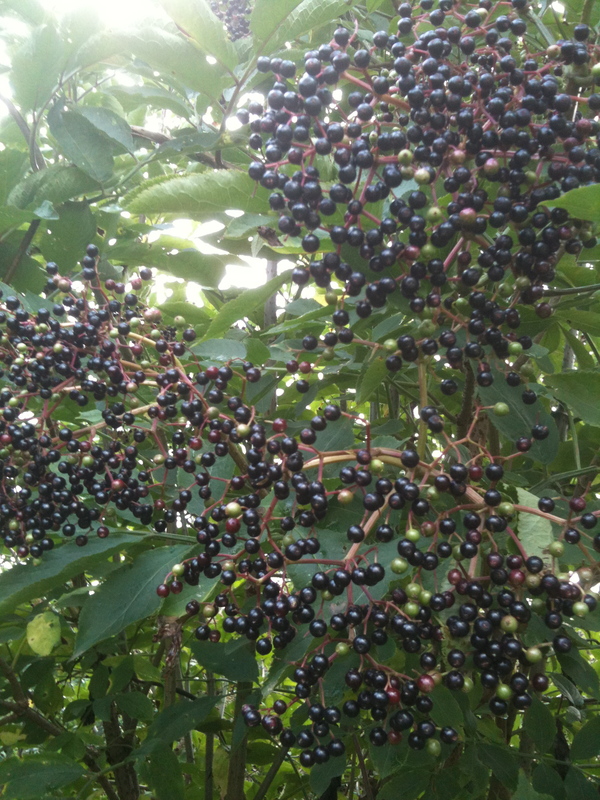 This basic recipe can be combined with other fruits such as rowan, elderberry, sloes, etc. 3 cups of sloes, 1.5 pints of water, and 3 cups of sugar to every 2.5 cups of juice. 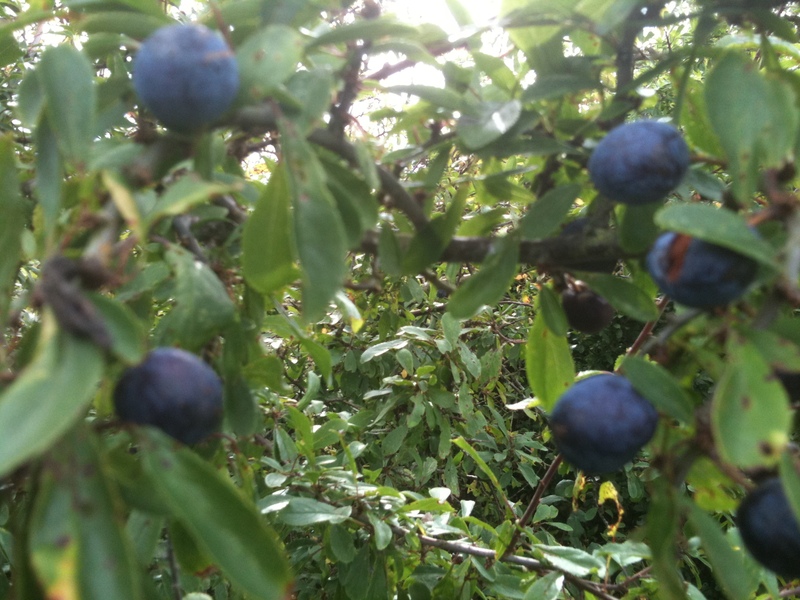 Wash the sloes and put them in a large saucepan with water, which should barely cover the sloes. Boil gently for 20 minutes until the fruit is soft, mash occasionally with a wooden spoon to help the juice to run. Drip through muslin. Measure the juice and return to a clean saucepan, add the sugar and bring slowly to a boil until the sugar is dissolved, then boil fast for 5 minutes. Skim and pour into warm sterilized jars. Wash the berries and strip them from their stalks. 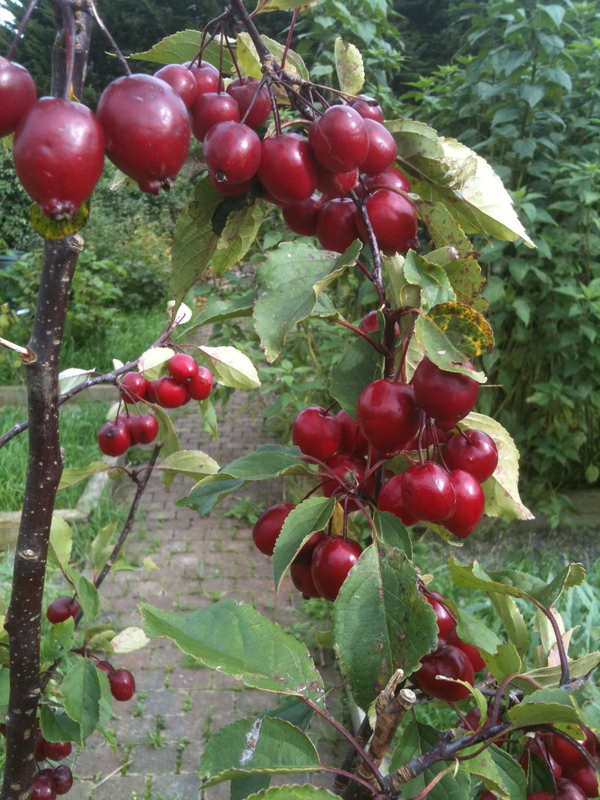 Wash the crab apples, and cut them in half. Put both fruits in a large pan, add enough water to barely cover the fruit. Bring to a boil and cook for 20 minutes until the fruit is soft. Pour through muslin and allow to drip. Measure the juice, return to a clean pan and add 400 g of sugar to each for each 500 ml of juice. Heat slowly until the sugar is dissolved, then boil rapidly for about 7-10 minutes until the liquid jells when dripped onto a cold saucer. Skim and pour into warm dry, sterilized jars. Bring two litres of the water to the boil in a large saucepan. 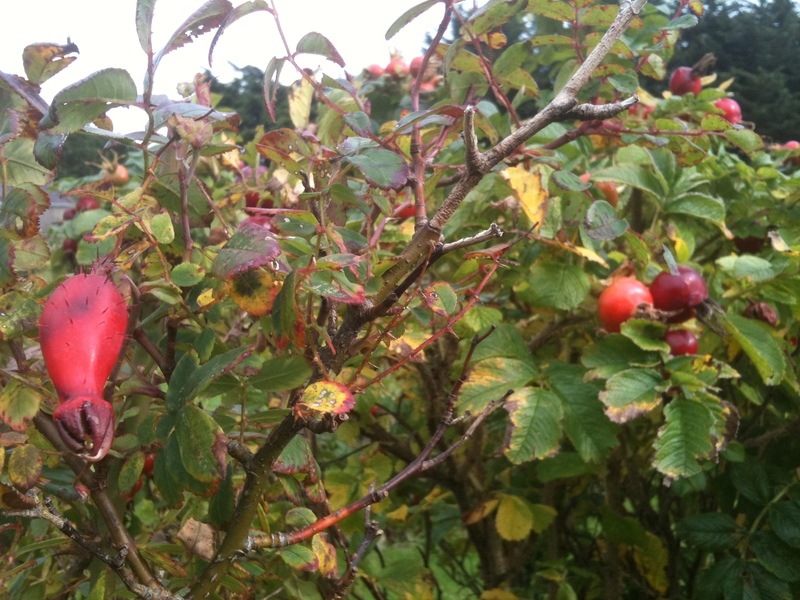 Chop the rosehips roughly in a food processor and add them to the boiling water. Bring back to a boil, then turn off the heat and leave to stand for 15 minutes. Strain well and collect the juice. 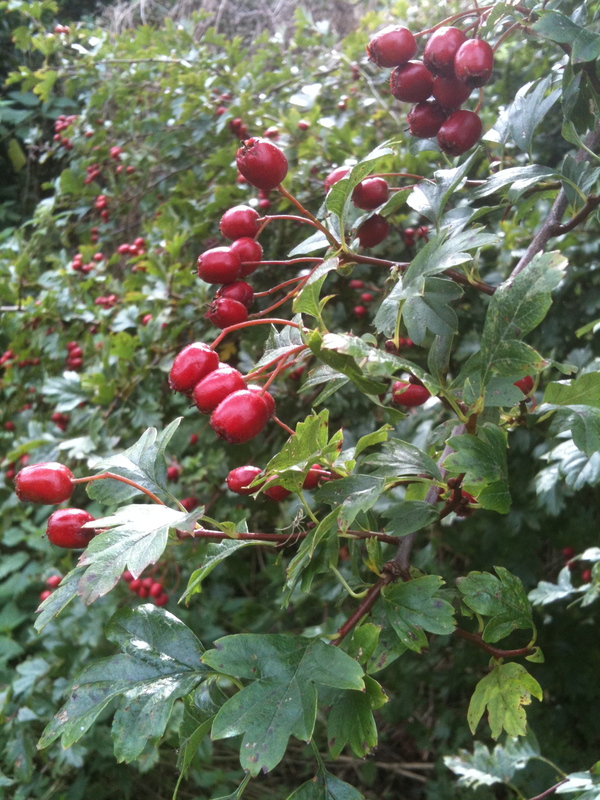 Put the rosehip mush back in the pot with 1 litre fresh water, bring it to the boil again then turn off the heat and leave to stand again for 10 minutes. Strain again. Put all of the juice in a clean saucepan, add the sugar, bring to the boil, stirring frequently and scraping down the sides, then boil for 5 minutes. Turn off the heat and leave the syrup to cool a little before pouring while still warm, into sterilised bottles or jars and seal immediately. Put the bottles in a large pan with cold water, bring to a boil and simmer for 10 minutes. Remove the jars and store in a cool place. A soup derived from a Darina Allen recipe. Heat 50 g of butter in a heavy saucepan. When it foams add 110 g of chopped onions and 150 g of chopped potatoes and turn them until well coated. Sprinkle with salt and pepper. Cover and cook for about 10 minutes. In another pan bring 500 ml of vegetable stock to a boil and in another pan 500 ml of creamy milk. Add both to the vegetables and simmer until cooked. Add 350 g of spinach and cut young nettle tops, stalks removed from both and the stems of the nettles. Cook with the lid off until cooked. Add 1 tablespoon of finely chopped rosemary. Liquidise and taste. Serve with natural yogurt or cream on top and fresh rosemary flowers. 90 ml double creme, 2 tablespoons of chopped rosemary, 2 garlic cloves, 6 free range eggs, 90 ml olive oil, 140 g plain self raising flour, 2 tablespoons ground almonds, pinch of salt, 80 g sun dried tomatoes, 100 g gruyere cut into 1 cm slices and 100 g parmesan cheese. Preheat the oven to 180 degrees and line and grease a round cake tin with baking paper. Put the cream, chopped rosemary and garlic in a small saucepan and bring to a bowl, switch off and leave to infuse for 15 minutes. Meanwhile whisk together the eggs and olive oil in a large jug. Put the flour, almonds and salt in a mixing bowl, stir and make a well in the centre. Slowly add the egg mixture, whisking to avoid lumps, until you have a thick batter. Pass the cream through a sieve directly into the bowl, discard the garlic and rosemary. Add the sun dried tomatoes and cheeses and mix well. Put into the prepared baking pan and lay two rosemary sprigs down the middle. Bake for 35-40 minutes until a skewer comes out clean. Remove from the oven and leave for five minutes, then remove the loaf from the tin, when cool cut into slices with a bread knife. 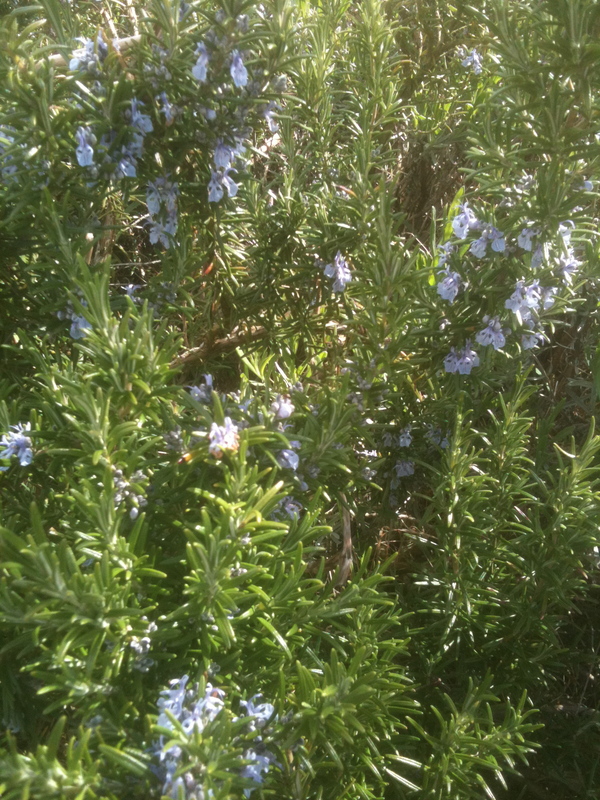 Cook rosemary sprigs in a pan of boiling water, wait until the water turns green and discard and strain the rosemary. Let the rosemary tea cool and add it to elderflower cordial with fresh lemon balm and mint sprigs and seep within a preserving jar in the fridge. 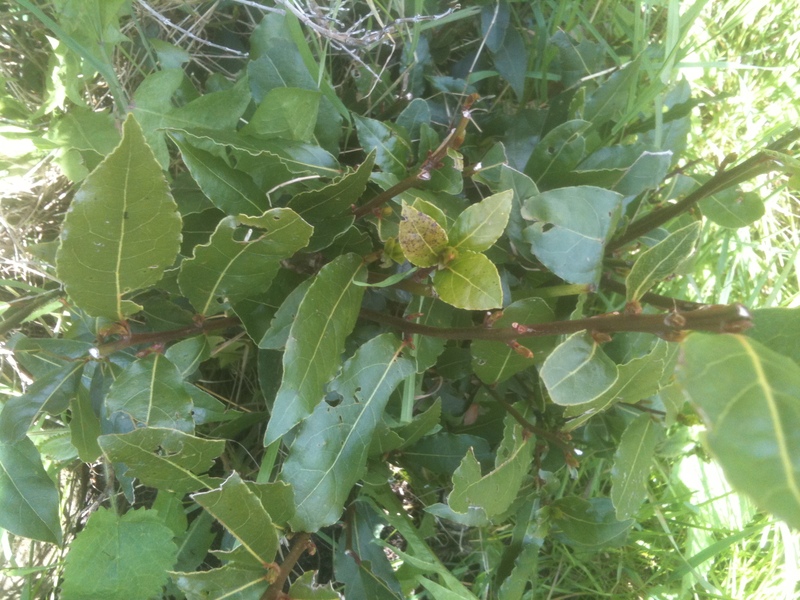 Elderflower cordial can be bought at health food stores and major supermarkets. This is a herbal cake, a moist cake made with olive oil and yogurt, infused with a herbal syrup. Edible flowers such as borage, rosemary flowers or crabapple flowers can be sprinkled on top of the cake, and fresh herbs such as lemon balm or rosemary can be placed around the cake as a decoration. Ingredients: Syrup: 100 g caster sugar, 150 g dark honey, one lemon and a handful of bay leaves. Cake: 300 g self raising flower, 100 ground almonds, 200 g caster sugar, finely grated lemon zest, 200 ml olive oil, 120 ml natural yogurt, 2 large eggs. Make the syrup first because it needs time to cool. Put the sugar in a pan with 200 ml of water and stir over a low heat until dissolved. Add the honey, lemon juice, zest and bay leaves and simmer for 10 minutes. Heat the oven to 180 degrees C (160 degrees C gas oven) Grease a round cake pan and line the base and sides with greased parchment paper. Mix the dry ingredients in a bowl. In a blender whizz together oil, yogurt, and eggs. Fold the liquid quickly and lightly into the flour mixture. Pour into the prepared cake tin and bake for 40 minutes or more, check regularly. Place the cake on a cooling tray and pour over the herbal syrup. (If the top of the cake is crusty, this could be gently and thinly sliced off before the syrup is applied). Decorate with edible flowers and herbs. Pick 6 heads of edlerflower in bloom, wash and place in a bowl with one gallon of spring water. Add 1 lb of caster sugar, 2 tablesppons of white wine vinegar and the juice of one lemon. Leave for one to two days, then strain through muslin and pour into preserving jars and leave for two to three weeks. Mix the coridal with sparkling water, fruit juices or cold fresh herbal teas (i.e. rosemary) to make a summer punch.